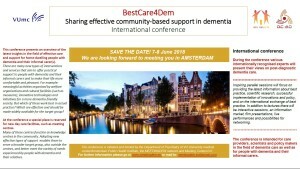 Preliminary programme BestCare4Dem now online! 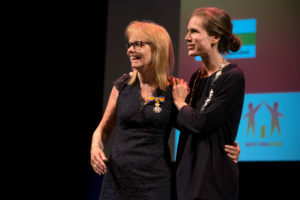 The preliminary programme of the international BestCare4Dem conference in Theatre DeLaMar in Amsterdam (7-8 June 2018) is now online available. Please have a look at the programma at a glance and the full programme! 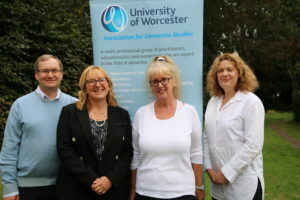 Comments Off on Preliminary programme BestCare4Dem now online! A four day training course about the Meeting Centre Support Programme will be held in Napels, Italy on 12 January, 19 January, 2 February and 9 Febuary. The course is lectured by prof. Rabih Chattat of the University of Bologna. For more information see the registration form(in Italian). Professor Joanna Rymaszewska from Wroclaw Medical University talks about the Meeting Centres on the local TV channel TCP3 Wroclaw. Click here to download the item (item in Polish). 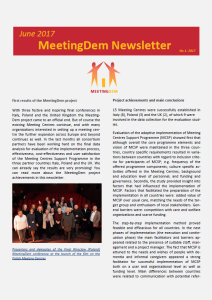 The MeetingDem project was mentioned in the March issue of the Alzheimer Europe Newsletter. 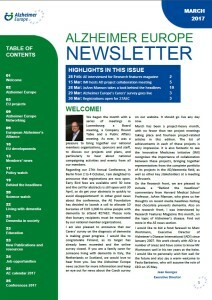 Please click here to read the newsletter.